The Children’s Media Conference depends upon the goodwill and volunteer effort of a huge range of people and companies across all the sectors we serve. We’d like to encourage you to join us in one of these vital roles. CMC sessions are all produced by volunteers drawn from a wide range of roles in the kids’ media community. We are indebted to them and to the speakers, moderators and presenters they persuade to join the conference every year. If you would like to produce a session, email greg@thechildrensmediaconference.com with your CV. If you have an idea for a topic for a session at the CMC, download and complete our offering content ideas proforma. NB the schedule for CMC 2019 is now substantially complete. Our sponsors are a cross-section of the kids’ media industry, ranging from major broadcasters to small service providers and indies. More information on becoming a sponsor. Our Advisory Committee meets monthly to develop the Conference theme, topics, speaker list and session ideas. Advisory members and ex-members all act as Executive Producers of the sessions and workshops at the CMC in July. Membership of the committee is by invitation. 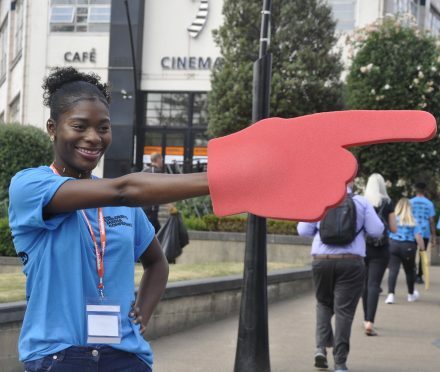 CMC welcomes student volunteers – drawn from universities and colleges across the UK. They work on sessions as runners, act as front of house assistants or take other roles. Take a look at Jessica Dodds’ Blog on being a CMC volunteer.